The Supreme Court has today extended its June 30 deadline for the publication of the final draft of the National Register of Citizens (NRC) in Assam. The new date set by the apex court is July 30, 2018. June 30 or July 30 – the Hindu Bengalis who are very much the citizens of India – are reportedly living in constant fear in the State. They are being consumed by the fear that once the final draft gets published – and their names do not appear – they will be branded as ‘D-voters’. It is reported that the lower middle class Hindu Bengalis are spending sleepless nights – the apprehension of being served notice from the Foreigners Tribunal to prove their citizenship. According to sources, the lower middle class segment – who can hardly afford two square meals a day – are ‘selling off their property’ to pay lawyers vis-a-vis to prove their citizenship. The authorities entrusted with detecting and deporting illegal Bangladeshi nationals in Assam seems to be on an ‘overdrive’ when it comes to serving notices to families suspected to be ‘D voters’. 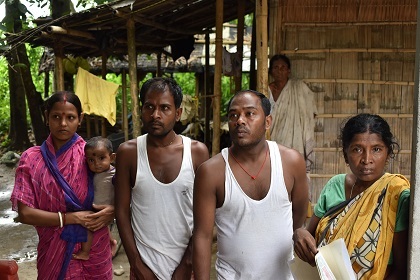 The travails which a family in Nichilamari Village (near Khoirabari under Tangla Police Station) in Udalguri district went through is bound to raise eyebrows as to the working of the entire Government machinery – especially when it comes to tracking D-voters. Joymoti Das (53), received a similar notice on November 29, 2008 from the Foreigners Tribunal, Mangaldai. Again, on May 6, 2013, the sexagenarian’s second son Ganesh Das (35) received a similar notice from the Foreigners Tribunal, Mangaldai. Though the said three family members very much have their names in the electoral rolls of 1965, still, on account of them being ‘illiterate’, they ran from pillar to post and bled white paying lawyers to prove that they were indeed Indian citizens. The harassment didn’t end here. Finally, it was sexagenarian Gopal Das who was served notice from the Foreigners Tribunal, Udalguri, in November 2017 to prove his citizenship. Das, who is the sole breadwinner of the family, had to reportedly cough up more than Rs 15,000 as lawyer’s fee. Unable to bear the mental pressure anymore and fearing that his name would not figure in the final draft of NRC, the sexagenarian allegedly committed suicide on the midnight of June 11 last near his residence at Nislamari village. Das, a daily wage earner, reportedly ended his life by consuming poison and today his wife and two sons are languishing in penury. The day Gopal Das committed ‘suicide’; it raised the hackles of the local people who raised slogans against the Government. Talking to NorthEast Now, wife of the deceased Joymoti Das blamed the powers-that-be for “harassing” genuine citizens like them for which her husband had to lose his life. Meanwhile, police officials in Udalguri are “totally silent” on the matter whether Gopal Das’s suicide is related to the NRC exercise. “It is too early to link the suicide with NRC. Everything will become bare only after a proper investigation is done,” stated a top police official in Udalguri. A Guwahati-based scribe, requesting anonymity, said, “The case of Gopal Das should be an eye-opener for the Government and the investigating agencies that they should go after illegal immigrants and not hound and harass genuine Indian citizens in the name of illegal immigrants.